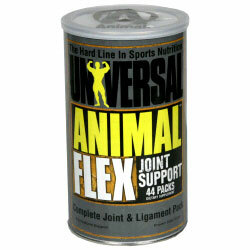 Animal Flex is a joint supplement by Universal Nutrition. Instead of being in a bottle, it comes in a canister with packs of 8 pills you consume on a daily basis. Animal Flex is actually one of the better supplements we examined. It has most of the ingredients we were looking for including: glucosamine HCl, chondroitin, MSM, boswellic acd, CMO, curcumin, and hyaluronic acid. We found no artificial dyes or coloring in Animal Flex. 4 stars out of 5. Overall, Animal Flex is one of the better supplements we examined with many helpful ingredients. Glucosamine Uses a combination of glucosamine HCl and glucosamine sulfate. We would have preferred to just see glucosamine HCl. Glucosamine is a precursor to glycosaminoglycans which are a major component of joint cartilage. Chondroitin Sulfate Also has chondroitin sulfate as a part of their 3000mg mixture of glucosamine, chondroitin, and MSM. Chondroitin makes up glycosaminoglycans which are a component of cartilage. Boron Doesn’t have boron, one of the most important ingredients for joint health. People that have boron as a part of their diet have a lower chance of developing osteoarthritis. Methylsulfonylmethane (MSM) Has MSM as a part of their 3000mg mixture of glucosamine, chondroitin, and MSM. MSM is a vital source of sulfur for protein and connective tissue synthesis. Boswellia serrata Has an undisclosed amount of Boswellia Serrata. Cetyl Myristoleate (CMO) Has cetyl myristoleate as a part of a cetyl myristoleate complex. Curcumin Has curcumin as a part of a 1000mg blend. It is unclear exactly how much curcumin is in the formula. Curcumin is used to reduce inflammation in Ayurvedic medicine. Hyaluronic Acid Has hyaluronic acid as a part of a 1000mg blend. Unclear exactly how much hyaluronic acid is included. Hyaluronic acid is a vital fluid found in the synovial (joint-lubricating) fluid. will this suppliment help heal shoulder pain?